Posted on 4/5/2019, 8:30 am, by rackycoo, under General Projects. 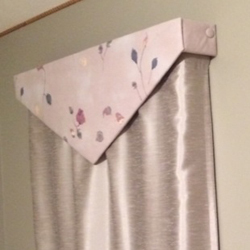 This weekend, dress up your curtains and make some pretty valances for your bedroom. EriChanHime used extra bedsheets to make the one shown here. She shares her process in her post, including how to make covered buttons. Lovely!